LOS ANGELES, Calif. /California Newswire/ — Star Trek fans – and it doesn't matter if you're a trekker or a trekkie – and those with interest in movie history have the chance to "boldly go where no man has gone before." The original iconic movie model of the USS Enterprise used in the first six Star Trek films is about to be rebuilt, Project Enterprise announced today. What happened to it? It succumbed to mishandling, respraying, and finally disappeared, crippled, into private hands in 2006, never to be seen again. Until now. Today, Nichelle Nichols, "Uhura" in Star Trek(R), is the official spokesperson for Project Enterprise – rebuilding the lost original USS Enterprise by the Hollywood team who created her for "Star Trek: The Motion Picture" in 1979. Paul Olsen, who spearheads this project, says that the demise of the Starship Enterprise is "a cinematic travesty for this most recognized movie icon in the history of American popular culture." But, they're planning to fix that. 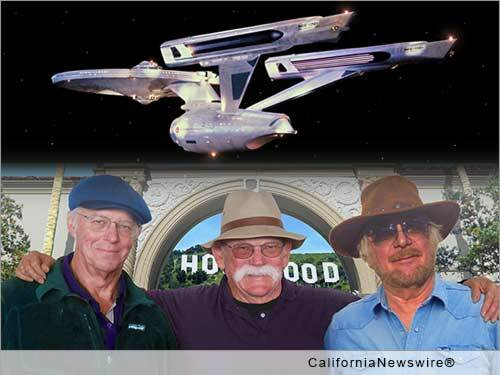 Richard Winn Taylor who designed the Enterprise, Jim Dow who built her, and Olsen who gave her a pearl ball gown, and also author of "Creating the Enterprise," are determined to return their beloved Starship Enterprise to her rightful place in the galaxy. The team's rebuild will be 50 percent larger and 200 percent more beautiful than the original. She will be 12-feet long and displayed in a spectacular spherical 3D state-of-the-art, LED-virtual reality environment designed by award-winning FX master Taylor. Projection mapping on the Enterprise will make her appear to be racing through time and space to dazzle her fans. The team will employ the illusory magic of one of Hollywood's master magicians (and Trek enthusiast) to complete the spectacle. Every aspect of the ship will be designed and built exactly as it was in 1979, only with more detail, employing the most modern techniques and materials to last well into the 24th century. And, in the manner of everything Star Trek, the fans will be central to the experience. "Millions of Star Trek fans around the world have kept Star Trek alive through their devotion and love, and this is their unique chance to play a part in rebuilding their revered Enterprise," Olsen says. It will always be kept on public show, and will tour the world indefinitely appearing at Star Trek and Comic-Con(R) conventions, casinos, iconic hotel and skyscraper lobbies and more. It's being built for the public, by the public and will never wind up in private hands. In a blowout ceremony, Star Trek's first lady, Nichols, will unveil the grand beauty at the Grauman's Chinese Theatre (aka TCL Chinese Theatre) on Hollywood Boulevard. This world event promises to not soon be forgotten. Star Trek Fans can donate towards the project and are offered a wealth of exclusive premium packages ranging from $20 to $3,000. Top-tier contributors will receive a lifetime VIP entry to any event where the Enterprise is displayed. Additional perks include meet and greets, a full day with their families at the studio to actually work on the Enterprise, dinner with the team and more. And, with an estimated 50 million Star Trek fans around the world, if just a fraction of those fans purchased one of the exciting, exclusive and unique premium packages, the team could raise the funds to launch this project which is expected to take 18-20 months to complete. A feature documentary directed by Taylor will catalog every step of the process. The initial fundraising goal is $300,000. "Beam me up, Scotty!" Project Enterprise is a complete program that includes kitting out a secure, dedicated facility from scratch complete with state-of-the-art tools and shop equipment, lighting, electrical upgrades, plus a spray booth, to build a show-stopping, stunning Enterprise from start to finish. Watch a YouTube video: https://youtu.be/noLYVC4uWxw . For more information, hi-resolution photographs, high-definition video, interview requests, or other queries, contact Paul Olsen at paul@projectenterprise.space or visit: http://www.projectenterprise.space/ . * Photo Caption: (L to R) Richard Winn Taylor, Jim Dow, Paul Olsen of Project Enterprise. Project Enterprise—-recreating the Enterprise by the original team!